We would like to take this opportunity to thank all the clients who gave their kind permission to allow their photos to be publicly displayed. B&A photos of our client at base line and at the follow-up visit 2 months after. Over that time the client had 4 Deep Cleansing Facials with Omnilux Light Therapy and used Lege Artis skin care products. 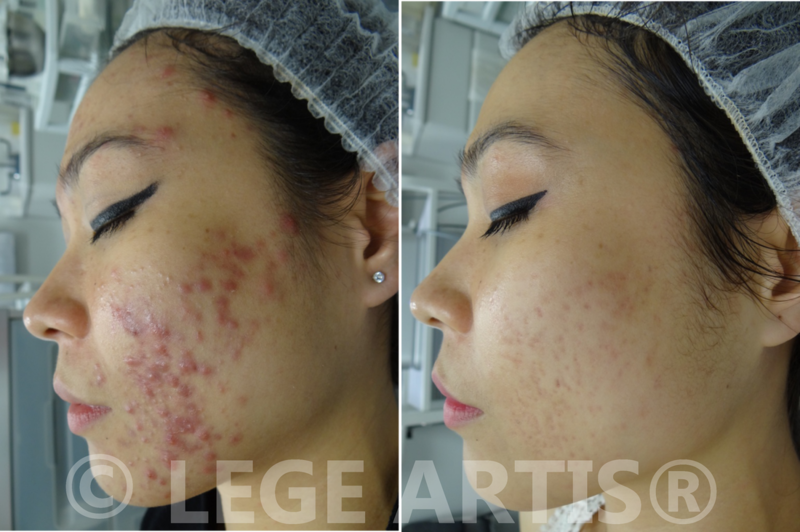 Our client received a course of IPL Acne Treatment treatments with Extraction treatments, and a Home Care regimen of Lege Artis Skin Care products. Above photos of our client: before and at the follow-up visit 4 months after the treatment completion. A combination of Lege Artis Signature Deep Cleansing Facials with a series of IPL Acne Treatment sessions, followed by V-beam laser sessions on the cheeks area. No other modalities had been used by the client except Lege Artis Home Care Products (B3B5 Gentle Mousse, Aspen Bark Concentrate and Soja Hx). Photos before and 4.5 months after. For the client above we used a combination of Lege Artis® Signature Deep Cleansing Facials, combined with Omnilux Light Therapy along with customized home care regimen. Above - oil cysts behind male ear area. 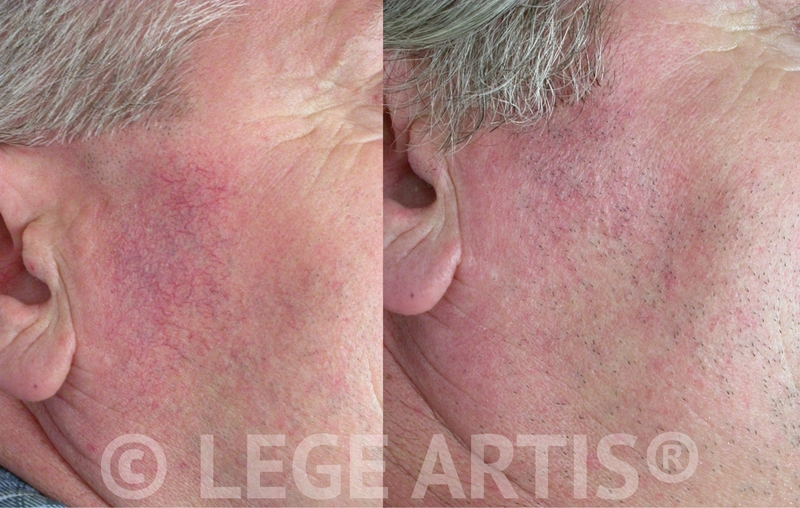 Photos show results of Lege Artis Extractions. Note redness is gone, the skin is clear. Extraction procedure is an integral part of Lege Artis Anti-acne Facials: Deep Cleansing Facial as well as PurAcne Oxygen Facial. For more information please refer to our Facials & Clinical Peels page. A combination of methods - Lege Artis Signature Deep Cleansing Facials with IPL Acne Treatment proved helpful in this case. IPL Acne Treatment results. Before: the client just finished a course of antibiotics prescribed elsewhere without much success. After: 6 months after the last IPL Acne Treatment - stable improvement continues, visible significant reduction in new acne breakouts, post acne redness is much reduced, scars are minimized, skin is tighter. This client continued to improve further even after his IPL treatments were completed. Post-Acne pigmented spots. 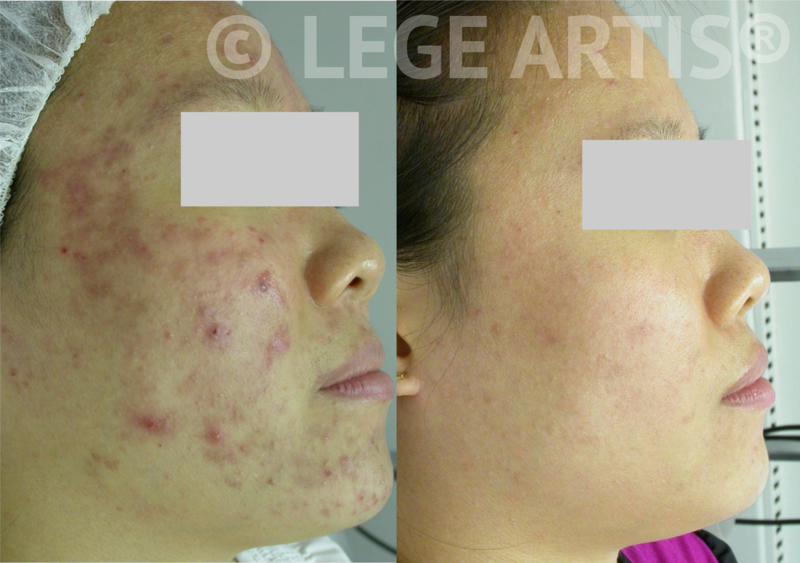 Results after series of Lege Artis® Clinical Peels combined with Extractions. 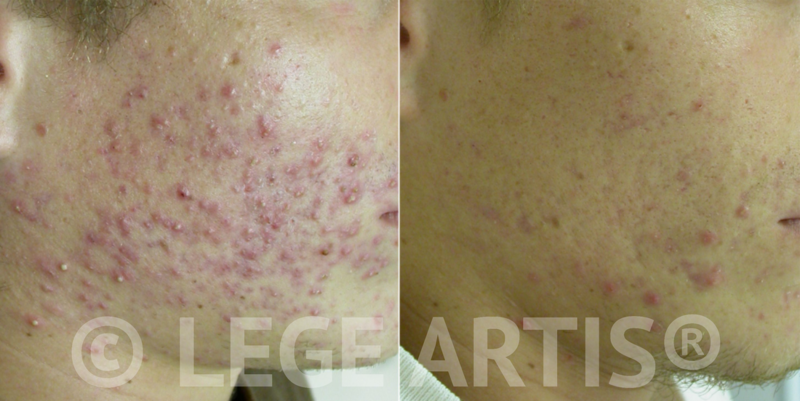 Results one month after a single session of Lege Artis® Clinic Signature Deep Cleansing Facial , followed by a single session of V-beam Laser Therapy delivered pore clearing, redness reduction as well as post- acne scar texture smoothening. 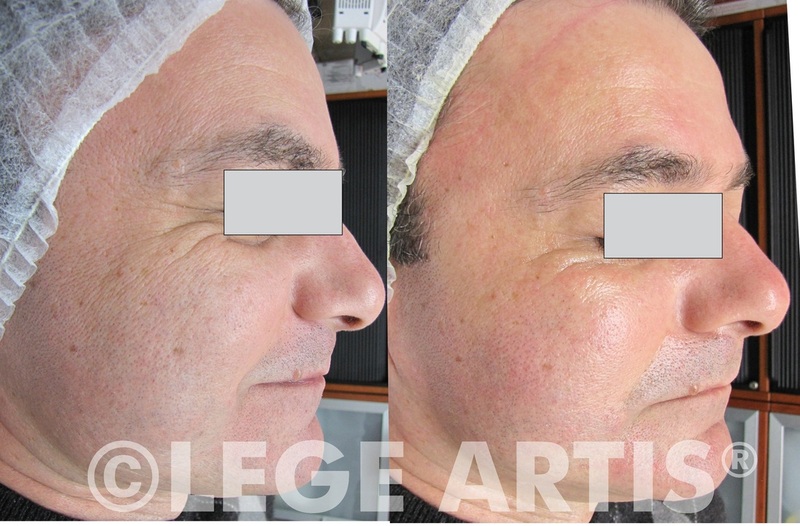 Result of one Lege Artis® Clinical Peel combined with Extractions. ​ The pores are cleared from blockage (comedones), the skin damaged layers are gently peeled off to reveal healthier younger skin. Hyper-pigmentation and "bumpy" appearance in the areas with acne and clogged pores - comedones. 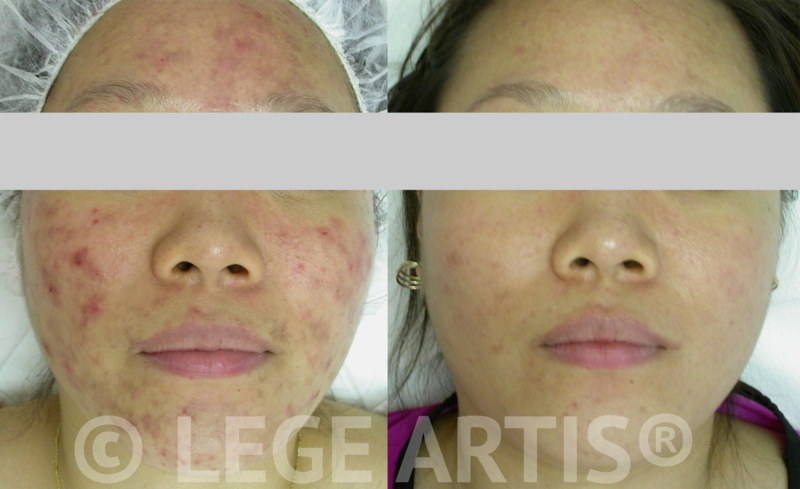 Results after 3 Lege Artis® Signature Deep Cleansing Facials with Omnilux Light Therapy. 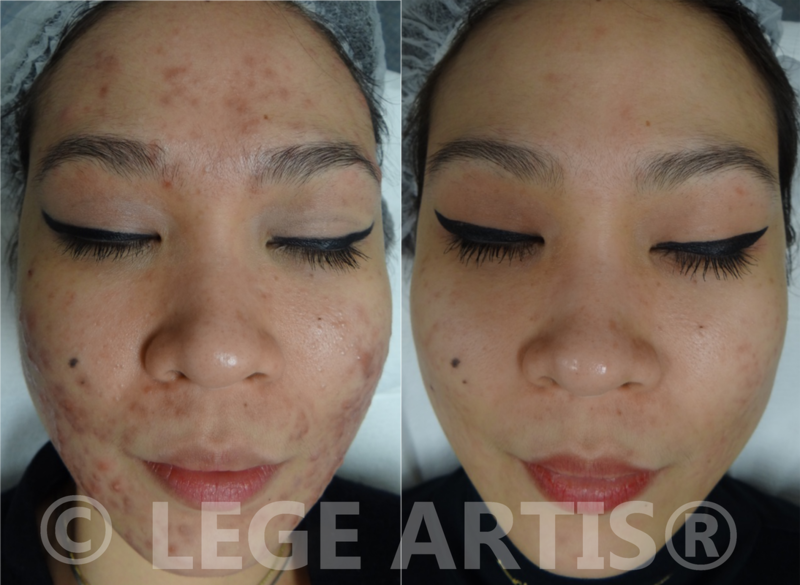 A combination of Lege Artis® Acne Toronto Clinic Signature Deep Cleansing Facial with IPL Acne Treatment delivered good results for a client on the above photos. Our acne skin facial treatment provides fast relief for acne-prone skin, while IPL Treatment improves the appearance of acne scars and post-acne redness. 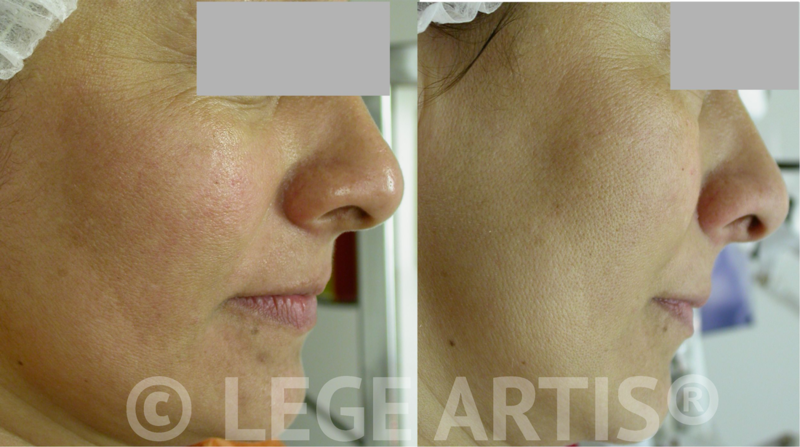 Results after just one OxyGeneo NeoBright procedure. Note improved skin texture, increased hydration, reduction in the appearance of fine lines and periorbital wrinkles, brighter and clearer complexion. Reduction of skin pigmentation, improvement of "crow's feet" appearance and overall skin rejuvenation. 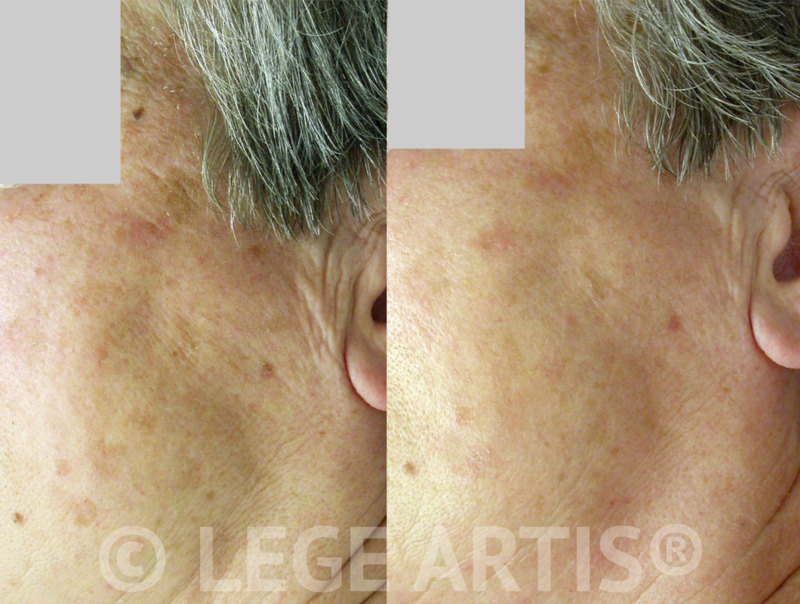 Results after series of Lege Artis® Clinical Peels combined with Omnilux™ Light Therapy. 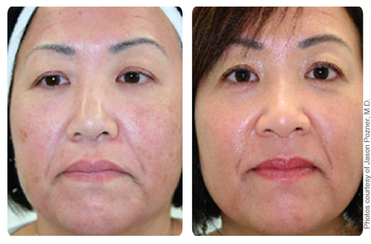 BBL Skin Photo-Rejuvenation Treatment results, improved skin clarity, more even skin tone. BBL Skin Photo-Rejuvenation Treatment results for photo-aged skin. BBL Skin Photo-Rejuvenation Treatment results - reduction of the appearance of sun spots and improved skin tone on back of hands. Reduction of wrinkles, faded sun/age spots, improved skin texture with skin tightening after 3 Skin Photo-Rejuvenation sessions. 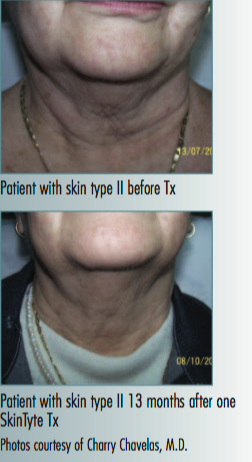 BBL SkinTyte anti-aging treatment on the neck area - skin firming and tightening. BBL SkinTyte anti-aging treatment on the face and neck area - reduced length and depth of wrinkles, improved skin clarity, face and neck skin firming and tightening. Results after a series of LightSheer Laser Hair Removal sessions in a male client, Fitzpatrick skin type II. Laser Hair Removal results on the underarm area on a female client Fitzpatrick skin type IV. Photos: before and at 5 months follow-up after 6 sessions. The pictures show unshaven areas, which allows to see the true amount of hair. Results after LightSheer™ laser hair removal. Male client. Fitzpatrick skin type IV. Before: Pigmentation and skin scarring related to a prolonged and repeated tweezing of the chin hair. After: Results after series of LightSheer™ laser hair removal in a female client Fitzpatrick skin type V.
Results after series of 3 Vbeam Laser Therapy sessions for facial redness and enlarged skin capillaries (thread veins). 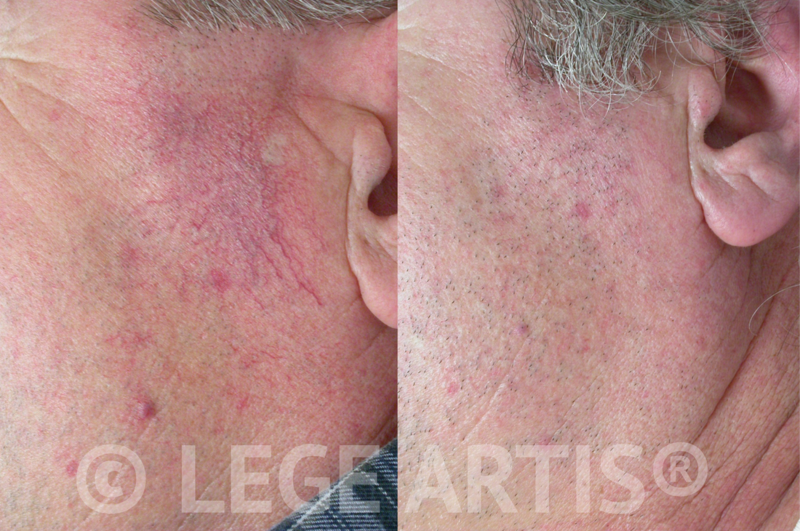 Results after 2 Vbeam Laser Therapy sessions for spider vein removal on the nose. Results after 3 Vbeam Laser Therapy sessions for nose redness and enlarged nose capillaries (thread veins). Reduction of redness and thread veins (marked with arrows) around the nose after one BBL session. 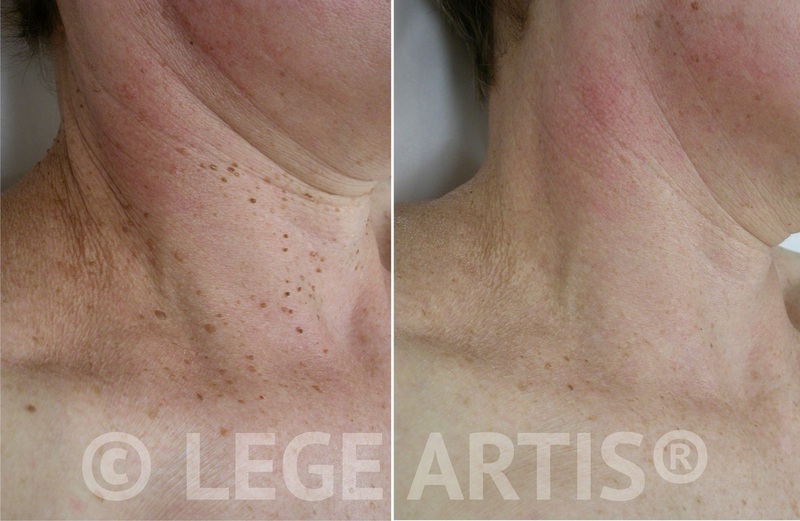 Skin Tag Removalresults on our client's neck and decollette areas. Skin Tag Removal result less than one month after the procedure. Note no scars, no marks (hyper-pigmentation) or redness. Skin Tag Removal result six weeks after the procedure. Note absence of scarring.